What’s there to worry about sea level rise; it’s going very slowly, right? Let’s put current sea level rise in a historical perspective. 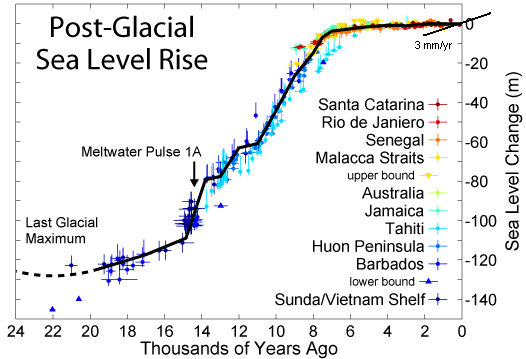 Here’s a graph of sea level since the last ice age. As the ice from the last ice age was melting, sea levels rose by some 120 metres over the course of about 8000 years, before it flattened out ~6000 years ago. On the top right, I drew a black line with an approximate slope of 3 mm/year, which is the current rate of sea level rise (over the past 20 years or so). 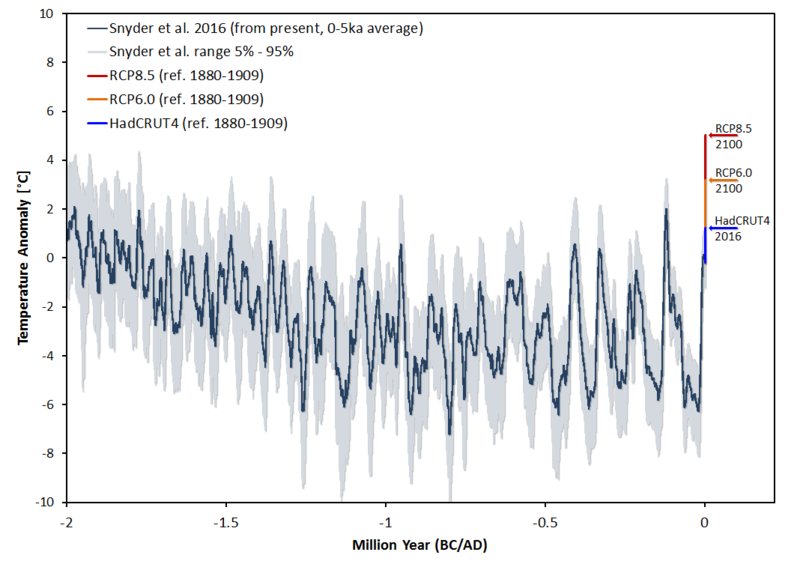 This is much faster than the relatively stable sea level during the ~6000 years before, though not as fast as the sea level rise at the end of the last ice age. Let’s zoom in on the last 9000 years (covering most of the Holocene epoch). 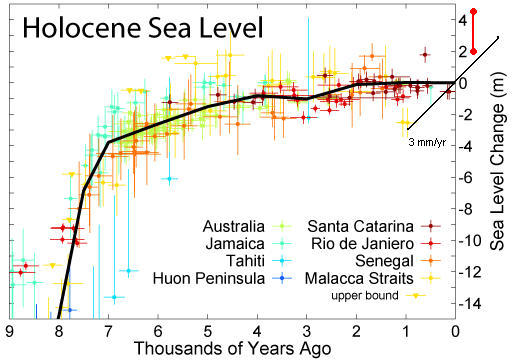 The strong sea level rise at the end of the last ice age is still visible on the left hand side, slowing down 7000 years ago and even more so 4000 years ago. Until recently: Current sea level rise represents a clear increase. For the future, most recent estimates of sea level rise fall between 0.5 and 1.5 metres in 2100. It won’t stop thereafter, since there’s a lot of inertia involved in warming up the oceans and in melting (parts of) the large ice sheets (Greenland and Antarctica). Under a business as usual scenario sea level will likely rise by multiple metres over the course of the next few centuries (see e.g. the Dutch DeltaCommittee and German WBGU reports). The vertical red line attempts to give an indication of these long term projections (which are uncomfortably uncertain). With increased warming, sea level rise will likely also increase, so the black line denoting 3 mm/yr can be seen as a lower bound (until the temperature goes down again and the climate system re-equilibrates). An upper bound is harder to predict, because that depends e.g. on tipping points being surpassed, such as parts of the great ice sheets becoming unstable. The fact that in the past sea level has risen with multiple metres per century means that such rates are physically possible. Whether that will happen again in the next millennium depends partly on nature’s forces (uncertainty in the physics, i.e. the response of ice sheets) and partly on what we do to poke nature around (uncertainty in our future emissions). 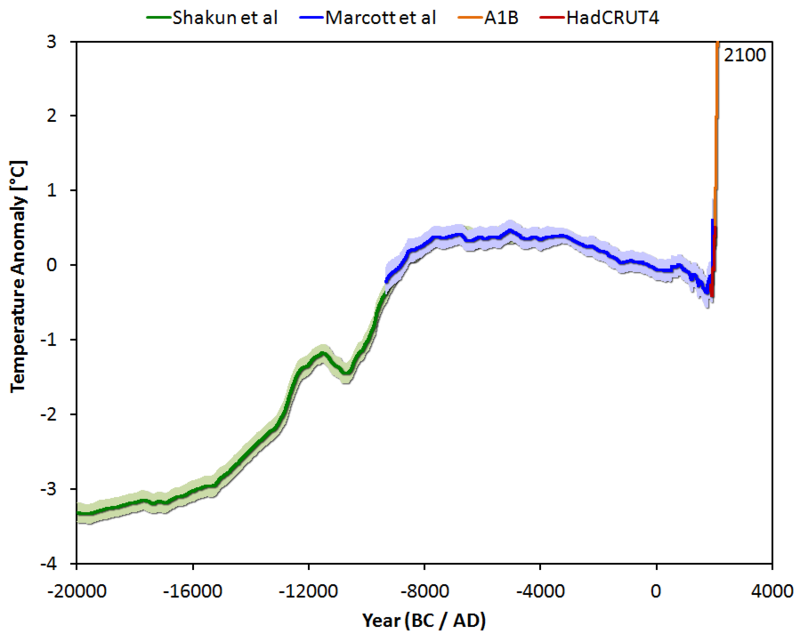 The period of relative stability of sea level over the past 6000–7000 years (Harvey and Goodwin, 2004 ) has now ended, and sea level is undoubtedly rising in the post-industrial period (IPCC, 2007a ). Given the massive heat capacity of the ocean, the Earth is already committed to many more centuries of sea-level rise due to thermal expansion alone. The dynamics of the large polar ice sheets and the rapid retreat of glaciers and ice caps will significantly add to the magnitude of sea-level rise. The critical questions are: how much and how fast? Several lines of evidence point towards a sea-level rise by 2100 of perhaps a metre higher than 1990, which is at the upper limit of the IPCC ( 2007a ) range of projections. First, the mid-range of projections of semi-empirical models is centred around 1 m (Rahmstorf, 2007; Grinsted et al ., 2009 ). Second, observed sea-level rise is currently tracking at or near the upper limit of the IPCC projections (Rahmstorf et al ., 2007 ; Domingues et al ., 2008 ). Third, recent observations show an increasing rate of mass loss from both the Greenland and West Antarctic ice sheets (Cazenave, 2006 ; Rignot and Kanagaratnam, 2006 ). Finally, an analysis of the kinematic constraints on dynamical ice loss suggests a plausible increase in sea level of 0.8 m by 2100 (Pfeffer et al ., 2008 ). Nevertheless, considerable uncertainty surrounds many of the processes that contribute to sea-level rise, especially concerning the dynamics of the large polar ice sheets. All of these uncertainties point in the same direction – towards more rapid and severe sea-level rise. Thus, rises higher than 1 m by 2100 cannot be ruled out.